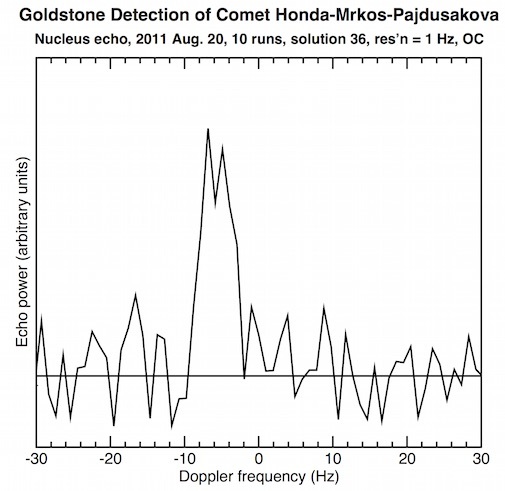 Goldstone radar observations on 2011 August 19 and 20 detected echoes from the nucleus and coma of comet 45P/Honda-Mrkos-Pajdusakova (HMP). This is only the fourth Goldstone comet detection and the first since detection of comet 73P/Schwassmann-Wachmann 3 in 2006. The CW spectrum above shows the opposite-circular echo from the comet obtained on August 19. The narrow spike is the echo from the nucleus and the broad, low, asymmetric hump is the echo from coma particles. The skew of the coma echo to positive frequencies indicates that most of the coma particles were approaching Earth at the time of the observations. The two lower figures show enlarged views of OC echoes from the nucleus on Aug. 19 and 20. The bandwidths are about 9 and 7 Hz. The Goldstone measurements provided a range correction of 49 km for the nucleus, which significantly improved the orbit and which revealed a systematic bias in many of the optical observations. This is only the fifteenth comet that has been detected with radar.